DOG GONE? FINDTOTO.COM CAN HELP! http://www.findtoto.com is a web-based service that can help you find your dog, cat, parakeet, whatever--just like Jessica Simpson did. Find Toto helped the lovely Jessica, recover her dog, Daisy, when the little scamp ran away. Knowing Jessica, the mutt probably wanted to get a vaccination. Immediately after notifying Find Toto personnel, they "alert thousands of neighbors within minutes." The website asks this question: "Can you notify 10,000 neighbors in 30 minutes? WE CAN!" They use a location-specific mapping system plus the most-current household database, and employ a call system that's used for emergency broadcasts. Check 'em out here. Taken together, fading vision, "romance" lighting, and menus with small type sizes/bad backgrounds, are forcing us Baby Boomers to take our "cheaters" with us when we go out for the evening. "Cheaters," of course, are those cheap, over-the-counter eyeglasses we can buy at the corner drugstore. Nor surprisingly, restaurants are accommoding their elderly customers by keeping a supply of visual aids--mini-flashlights, magnifying glasses, and "cheaters"--on hand. Sometimes, they simply give up and increase the font sizes on their menus. As one Minneapolis restauranteur put it, "It seems like if I do anything under size 12 in the font, I get complaints. I'm sure in 15 years I'll be one of the guests complaining about not being able to read the menu." However accommodating restaurants and bars may be to their Boomer customers, they're reluctant to adjust the lighting. After all, how many of us get better looking in harsh lighting? 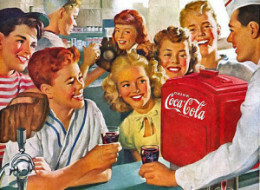 MAKE YOUR OWN COKE AT HOME: SECRET RECIPE REVEALED!